Ever since the release of the new Mac Pro, fans of Apple computers and Windows PCs have been fighting post-by-post on forums across the Internet, arguing over whether the new Pro is a miniature powerhouse or a fancy, overpriced ash tray. The argument has continued not only because fanboys and fangirls are tireless, but also because there are so many ways to compare Cupertino’s latest and greatest. The Mac Pro’s performance has already been analyzed from a few angles, including a comparison with high-end hardware from Dell, Lenovo and HP, and a comparison to what you can build yourself, but what happens when Apple goes toe-to-toe with a boutique PC maker who specializes in powerful, expensive hardware? To find out, we decided to put the new Mac Pro up against Origin’s recently revised Genesis, which was revealed at CES 2014. Origin even offers a workstation variant of its most powerful desktop which targets the same people who might be in the market for the new Mac Pro. Can Origin’s boutique PC stand up against Apple’s finest? To keep the comparison fair, we decided to select configurations with similar hardware that are similarly priced. We loaded the Pro to the gills, which brings its price to $9,599, and then customized an Origin Genesis until it was similarly expensive. This brought its total to $10,258, about $650 more than the Pro. We didn’t add any peripherals, like a monitor or keyboard, to either; both prices are for the computer alone. 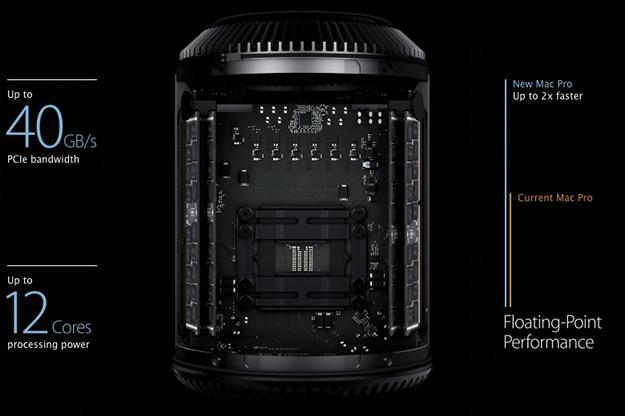 Both the Mac Pro and the Genesis top out with the same processor, Intel’s Xeon E5-2697 v2. Boasting twelve cores, twenty-four threads and a Turbo Boost maximum clock speed of 3.5 GHz, it’s an insanely quick piece of kit, a true titan among titans. However, configuring the Origin with this processor inflates the price to almost $11,000, so to keep the comparison fair we had to downgrade it to the Intel Xeon E5-2690 v2. Though this processor offers a slightly higher Turbo Boost clock of 3.6 GHz, it loses four cores, which puts a big dent in its performance relative to the Pro’s twelve-core monster. Of course, the Origin is potentially just as fast; faster, even, because it can be configured with a dual-CPU motherboard, making the use of not one but two 12-twelve core processors possible. But configuring the Genesis with the same processor found in the top-end Mac Pro requires a larger budget or a video card downgrade, and that means the first round goes to Apple. We decided not to downgrade the video card in favor of a quicker processor because taking that route would make the Genesis woefully under-gunned in this portion of the comparison. Even as it stands, the system’s Nvidia Quadro 6000 graphics card manages “only” 1 TFLOPs of single-precision performance or 515 GLOPs of double-precision grunt. That’s a lot, but the pimped-out Mac Pro’s AMD-supplied FirePro D700 can reach 3.5 TFLOPs of single-precision performance or 870 GLOPs of double-precision speed. The D700 also offers more memory bandwidth than the Quadro 6000 (264 GB/s vs 144 GB/s). Both have six gigabytes of RAM. It is possible to make the Origin Genesis quicker by adding a second Quadro 6000, but the cards are priced at almost $5,000 each. You read that right – almost five grand a pop! Adding an extra card is a luxury few buyers will be able to afford. One of the Mac Pro’s standout features is its PCI-e solid state drive, which boasts transfer speeds exceeding one terabyte per second. That’s very, very quick, and Origin’s selection of SATA SSDs can’t hope to keep up. The downside to this speed, however, is storage capacity. The base Mac Pro only has a 256GB drive, and it can be upgraded to no more than 1TB. That’s not a lot for a system that might be used to work with very large files. Worse, there’s no room for expansion, and the drives are non-standard, which means aftermarket PCI-Express drives like OCZ’s RevoDrive will not fit. Our Origin configuration also has a 1TB SSD in the form of Samsung’s 840 EVO, but unlike the Mac Pro, the Genesis offers room to expand. A maximum of thirty-three hard drives can fit inside a Genesis. Up to five of those drives can be hot-swapped and, for buyers concerned about security, the hot-swap cage can be configured with a lock. These computers max out at sixty-four gigabytes of RAM each, but upgrading the Apple is roughly twice the price ($650 for the Genesis, $1,300 for the Mac Pro) . The memory each uses is otherwise identical, so the nod clearly goes to the Genesis. Both the Mac Pro and the Origin Genesis offer unique enclosures that are radically different from any sold before – and from each other. Apple, as usual, has gone with a proprietary approach that uses non-standard hardware configurations to achieve maximum performance in a small, light computer. Though it is serviceable by the end user to a degree, the Pro is more difficult to repair and has almost no room for expansion. On the plus side, though, it’s easier to move and fits in tight spaces with ease. 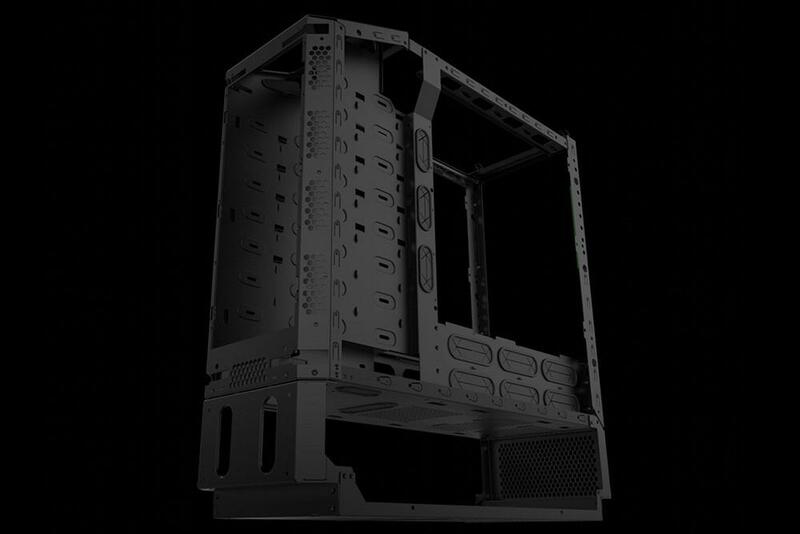 Origin’s larger enclosure is also unique, but it’s built to accommodate all standard hardware and give the user a wealth of options when configuring the system. The internal layout can be flipped from left to right or rotated so that airflow exhausts from the top rather than the rear. 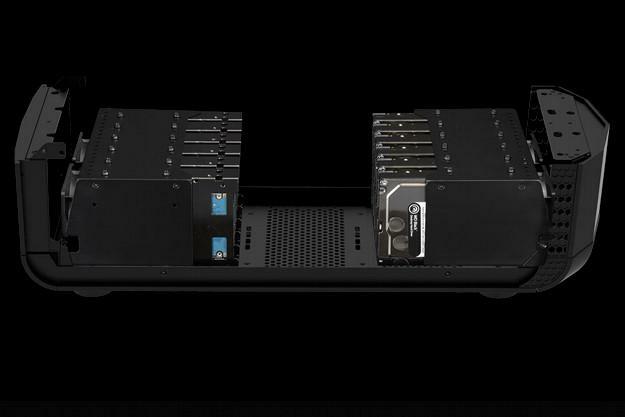 A hot-swap hard drive bay is standard and the lower half of the system can be configured with water cooling (for users who want maximum performance) or hard drive mounts (for those who want extra storage). Better still, all of the configuration options offered by the Genesis can be changed after purchase, so you don’t have to buy a new case if your needs change. When you’re spending enough on a PC to buy a nice used car, you’ll want some assurance your new PC isn’t going to break anytime soon. That guarantee is (or isn’t) provided by the warranty, so it’s worth consideration. Surprisingly, Apple does not offer a default extended warranty with the Mac Pro. Plunking down almost ten grand grants you the same level of support as a user who purchases a $999 MacBook Air. However, an AppleCare three-year plan is available for $249, which means you can grab it and still spend less than you would on the Genesis. That doesn’t mean Origin loses, however. While it also has a 1-year standard warranty, it trumps Apple with free lifetime labor and 24/7 support. You can call any time, day or night, and get a hold of an Origin representative no matter the age of your Genesis, while Apple cuts you off after 90 days. That is, unless you purchase AppleCare, in which cases they’ll talk to you free of charge for three years. 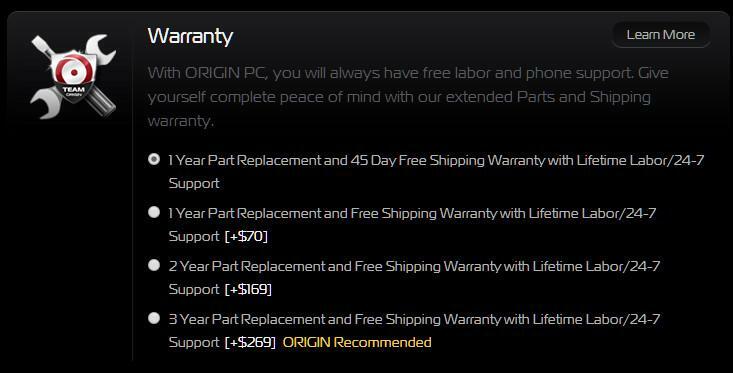 Origin offers an upgrade to a 3-year parts warranty for $269 and also sells a 3-year parts upgrade service for $40. Buyers who choose the parts upgrade service can send their PC back to Origin to have upgrades installed, and the value of the parts removed to make room for new components is credited to the owner. Apple offers no similar service. 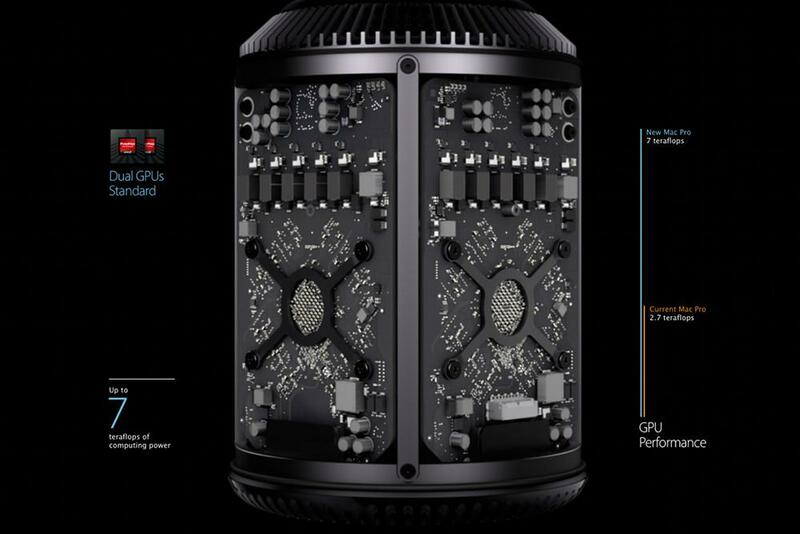 There’s no disputing the Mac Pro’s performance value. Compared to the Genesis, or any other pre-built PC, Apple’s alternative is quicker at any price point below $10,000. Credit for this can largely be given to the video cards, which are extremely relative to the Pro’s price. Whatever back-room deal Apple struck with AMD is paying dividends. Yet the Mac Pro has a huge weakness; storage. While we appreciate the speed of the Pro’s solid state drive, the lack of potential for future upgrades could prove a major roadblock for some buyers. Even a daisy-chain of Thunderbolt external drives won’t come close to what the Genesis can accommodate. This issue is particularly important for a workstation, because the people who buy these systems often work with files far larger than anything the average home user encounters. Origin also chips away at Apple’s lead with its more affordable RAM, highly upgradeable case and superior level of support. When these factors are added, the result is clear; the Genesis is a better platform for powerful hardware.